Jennings Farley & Seeley Funeral Home & Crematory has served Logan County for a total of 11 years. Jennings Farley & Seeley Funeral Home & Crematory was known as Littleton & Rue Funeral Home from 1986 - 2008. In 2008 it was purchased by the current owners and named Jennings Farley Funeral Home from 2008-2017. In 2017 it was changed to Jennings Farley & Seeley Funeral Home & Crematory due to the addition of Kurt Seeley. "My father, David L. Seeley, was a Funeral Director for many years, so I had grown up around the business," said Funeral Director, Kurt Seeley. "At the age of 17 I knew that being a Funeral Director was the career I was going to pursue. I still believe now, as I did back then, that we are all meant to do a certain job and are given a certain skill set to be able to do that job, and being a Funeral Director is what I believe I am meant to be." 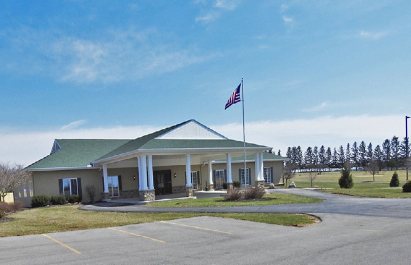 Jennings Farley & Seeley Funeral Home & Crematory is one of four Funeral Homes in the state of Ohio that have the combination of a Funeral Home, Crematory, Cemetery and Mausoleum at one address. "Our business, also with owning and operating Highland Memorial Cemetery and Liberty Cremation Service, allows us to provide any current service selection of a loved one to the people who have experienced a death in the family, without the families loved ones ever leaving our supervision," said Kurt Seeley. "We also assist in serving families who experienced the loss of a pet." Jennings, Farley and Seeley Funeral Home & Crematory have been Chamber members for over 10 years. Mr. Farley and Mr. Seeley both enjoy the business to business conversations and networking options the Chamber provides. They feel it is a great way to build relationships with members in the community as well. "Many people may not realize my connection with Logan County from years ago," said Funeral Director Rick Farley. "I actually was with Littleton funeral home in Springfield, who built our facility in Logan County in 1986. I managed that facility from 1991 to 1996. I returned in 2009 and became a partner with our current ownership in 2012. Seeing a lot of the growth in Logan County was very exciting especially on the south side of Bellefontaine." Please join the Chamber in congratulating Jennings, Farley and Seeley Funeral Home & Crematory as our April Business of the Month. For more information on the services the Funeral Home & Crematory provides, please contact Mr. Farley or Mr. Seeley at 937-599-2139 or e-mail them at jenningsfarley@gmail.com. July: Belser Accounting and Tax Service, Inc.
February: Lee Surveying & Mapping Co.
July: Ed Donnelly Ent. Inc.
April: Global Organic Alliance, Inc.
October: Fire Safety Services, Inc.
May: Peterson Electric & Heating Inc.